A dive mask is probably one of the first pieces of dive kit we buy and learn how to use, crucial for being able to enjoy activities underwater. Many of the early skills we learn are in regard of clearing and coping with mask problems. Imagine an option where these problems are removed. 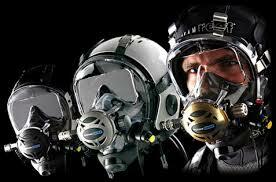 Your vision rarely fogs, water rarely penetrates the mask seal and you don`t get jaw ache from gripping a regulator. Welcome to the world of the Ocean Reef Integrated Full Face Mask. Get used to having a warm, dry face, being able to breath naturally through mouth AND nose and crystal clear, huge field of vision. Easy, natural communication with buddies and many more advantages. During a confined water session you will learn the basics of donning and doffing your Ocean Reef Mask, and check out your theoretical understanding of the equipment & procedures. Equipment considerations; same as a coventional mask you will learn and practice emergency mask skills, just in case. Two open water dives will complete your skill set and confidence in the use of Ocean Reef Integrated Masks. Including communications if this option is chosen. For all your Ocean Reef Full Face Mask course materials, contact DIVEWORLD. We are a stocking and servicing centre for Ocean Reef too so can meet all your IDM requirements. Ocean Reef Full Face Masks will be a huge advantage for any future courses. No matter what time of year be the guy with the warm, dry face and big grin. Digital Underwater Photographers will love the improved vision and no fog characteristics. Sidemount and Tec diving can be made easier and safer by utilising the dual tank valve to switch tanks or gasses and never being without a 2nd stage! Why not integrate your IDM course with the Underwater Communications course & maximise the fun? This specialty can be counted towards PADI Master Scuba Diver too. For more information about this or other PADI courses have a chat with one of our specialist instructors. Why not try out a mask before commiting, IDM try-dives available at club nights.